Talkative: Then Talkative at first began to blush; but, recovering himself, thus he replied: You come now to experience, to conscience, and God; and to appeal to him for justification of what is spoken. This kind of discourse I did not expect; nor am I disposed to give an answer to such questions, because I count not myself bound thereto, unless you take upon you to be a catechizer, and, though you should so do, yet I may refuse to make you my judge. But, I pray, will you tell me why you ask me such questions? Faithful: Because I saw you forward to talk, and because I knew not that you had aught else but notion. Besides, to tell you all the truth, I have heard of you, that you are a man whose religion lies in talk, and that your conversation gives this your mouth-profession the lie. They say, you are a spot among Christians; and that religion fares the worse for your ungodly conversation; that some have already stumbled at your wicked ways, and that more are in danger of being destroyed thereby; your religion, and an ale-house, and covetousness, and uncleanness, and swearing, and lying, and vain-company keeping, etc., will stand together. The proverb is true of you which is said of a whore, to wit, that she is a shame to all women; so are you a shame to all professors. Talkative: Since you are ready to take up reports and to judge so rashly as you do, I cannot but conclude you are some peevish or melancholy man, not fit to be discoursed with; and so adieu. Faithful: But I am glad we had this little discourse with him; it may happen that he will think of it again: however, I have dealt plainly with him, and so am clear of his blood, if he perishes. That’s past the full, into the wane he goes. In response, Talkative first blushes; his embarrassment betrays the truth. Though Talkative speaks well of grace, he has not lived in ways that testify to a true work of grace in his heart. But any conviction he feels is quickly quenched. Talkative becomes defensive. He retreats behind barriers that are sure to cut him off from the help he needs. He feels caught off guard and put on the spot. He wasn’t expecting this kind of discourse. He’s not ready to answer such pointed questions. He is unwilling to have his life so closely examined and scrutinized. He asks why Faithful would ask him such questions. Faithful is unwilling to let Talkative continue on in his hypocrisy, saying beautiful words but living in mire. Faithful tells him plainly that his life betrays his words. He uses the language of Jude and compares Talkative’s life to a “spot” (Jude 12–13), warning that his shameful and ungodly conduct is a danger and stumbling block to himself and others. Talkative accuses Faithful of being unkind and rash. He feels judged and mistreated. Many in our day would likely side with Talkative and agree. Isn’t it cruel and insensitive to drive Talkative away with so blunt an evaluation of his life? Wouldn’t words of sympathy and understanding sound more loving? Yet Talkative is deceived and entrenched in sin. The most unloving thing Faithful could do would be to coddle Talkative in his sin and deception and treat him as a fellow pilgrim as if nothing were amiss. But didn’t Jesus command: “Judge not, that ye be not judged” (Matthew 7:1)? Surely Faithful is being to hard on Talkative! After all, aren’t we all sinners? These words from the Sermon on the Mount are often quoted but seldom understood in context. Jesus is not here giving a pass to those who are still infatuated with their sin. He is warning us of hypocrisy. Our own sin should loom largest in our eyes. We must turn away and flee from our own sin and then we will see clearly to help others turn from the sins that beset them. Talkative’s pride and lack of humility betray an unchanged heart. He is not open to counsel but resistant. He is uncomfortable, yet unconvicted. He is unwilling to remain in a relationship where he is held accountable and his sin is exposed, and so he separates from Faithful to go his own way. After Talkative departs, Christian counsels Faithful to let him go. Talkative’s loss is his own. He claims to know the gospel, yet lives in ways that are offensive and contrary to the gospel. He speaks well of truth, yet is offended and unreceptive when Faithful brings it to bear upon his life. He has opportunity to receive help, yet walks away. “They went out from us, but they were not of us; for if they had been of us, they would have continued with us; but they went out that they might be made manifest, that none of them were of us” (1 John 2:19). God’s Word commands us to separate from those who would claim Christ yet cling to sin. “If anyone teaches otherwise and does not consent to wholesome words, even the words of our Lord Jesus Christ, and to the doctrine which accords with godliness, he is proud, knowing nothing, but is obsessed with disputes and arguments over words, from which come envy, strife, reviling, evil suspicions, useless wranglings of men of corrupt minds and destitute of the truth, who suppose that godliness is a means of gain. From such withdraw yourself” (1 Timothy 6:3–5). “So you, son of man: I have made you a watchman for the house of Israel; therefore you shall hear a word from My mouth and warn them for Me. When I say to the wicked, ‘O wicked man, you shall surely die!’ and you do not speak to warn the wicked from his way, that wicked man shall die in his iniquity; but his blood I will require at your hand. Nevertheless, if you warn the wicked to turn from his way, and he does not turn from his way, he shall die in his iniquity; but you have delivered your soul” (Ezekiel 33:7–9). Christian also commends Faithful for doing the right thing by speaking plainly to Talkative. Christian laments: “there is but little of this faithful dealing with men now-a-days.” If we were more honest with one another, our witness before others would carry more weight. Perhaps we would see more desirable results. Those in whom saving grace is at work would be encouraged to repentance and faith. They would welcome and receive the Word of God as profitable for doctrine, for reproof, for correction, for instruction in righteousness (2 Timothy 3:16). Those who still embraced their sin would be exposed, unable to continue their masquerade. The company of saints would be a place “too hot” for them to hide and too real for them to go on pretending. In Christ we have no reason to fear having our sins uncovered. The cross has made known to the world our sinfulness and rebellion. There is forgiveness and cleansing for all who confess their sins and flee to Christ. There is no need to hide our sin or to pretend to be something we are not; in fact, it is hypocrisy and utter foolishness to do so. Talkative makes a regrettably unwise decision. Rather than humbling himself, accepting the true and faithful counsel of one who has befriended him in Christ, repenting of sin, and finding forgiveness in the gospel, he chooses to separate himself and continue pretending all is well. 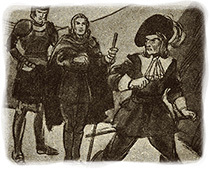 The departure of Talkative is one of the saddest portions of The Pilgrim’s Progress. It describes one who claims to follow Christ, yet turns away from truth, ensnared by his own pride and deception. Sadder still, it describes a response that is all too common. It is a response that has hindered many from finding the peace, joy and forgiveness found in true repentance from sin and faith in Jesus Christ. Talkative’s departure should be a warning to us. May God help us live and speak in ways that agree and commend the gospel. May we be quick to listen, slow to speak, and unwilling to separate ourselves from those who are willing to press us with truth and do our souls the most eternal good. But, thinking again of what he had heard from the men, he felt in his bosom for his roll, that he might read therein, and be comforted; but he felt, and found it not. Then was Christian in great distress, and knew not what to do; for he wanted that which used to relieve him, and that which should have been his pass into the Celestial City. Here, therefore, he began to be much perplexed, and knew not what to do. At last he bethought himself that he had slept in the arbor that is on the side of the hill; and, falling down upon his knees, he asked God’s forgiveness for that his foolish act, and then went back to look for his roll. But all the way he went back, who can sufficiently set forth the sorrow of Christian’s heart? Sometimes he sighed, sometimes he wept, and oftentimes he chide himself for being so foolish to fall asleep in that place, which was erected only for a little refreshment for his weariness. Thus, therefore, he went back, carefully looking on this side and on that, all the way as he went, if happily he might find his roll, that had been his comfort so many times in his journey. 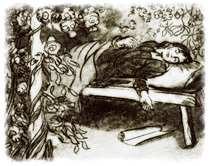 He went thus, till he came again within sight of the arbor where he sat and slept; but that sight renewed his sorrow the more, by bringing again, even afresh, his evil of sleeping into his mind. Thus, therefore, he now went on bewailing his sinful sleep, saying, O wretched man that I am that I should sleep in the daytime! That I should sleep in the midst of difficulty! That I should so indulge the flesh, as to use that rest for ease to my flesh, which the Lord of the hill hath erected only for the relief of the spirits of pilgrims! How many steps have I took in vain! Thus it happened to Israel, for their sin; they were sent back again by the way of the Red Sea; and I am made to tread those steps with sorrow, which I might have trod with delight, had it not been for this sinful sleep. How far might I have been on my way by this time! I am made to tread those steps thrice over, which I needed not to have trod but once; yea, now also I am like to be benighted, for the day is almost spent. O, that I had not slept! When Christian hears the report from Timorous and Mistrust that there were lions ahead, he himself begins to fear. He looks for his roll for comfort, but discovers it is missing. As we learned earlier in the story, the roll represents Christian’s “assurance of life and acceptance at the desired haven.” It fell from his hand while he was asleep in the arbor. In the arbor Christian made a costly mistake. He slept in the daytime, when God had given him light. 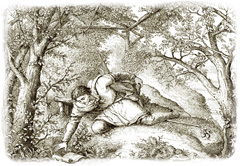 He slept in the midst of difficulty, when he had not yet reached the high ground. He became careless when he found opportunity for ease. So long as he was climbing and clambering up the hill, he was determined to move ahead, but he settled in to stay when he found a place to rest. As a result he fell asleep and his roll slipped away. He lost his confidence and determination. Without his roll Christian became distressed and perplexed. He had determined to go forward, saying, “I must venture.” But now he is uncertain and distraught. Therefore let us not sleep, as others do, but let us watch and be sober. For those who sleep, sleep at night, and those who get drunk are drunk at night. But let us who are of the day be sober, putting on the breastplate of faith and love, and as a helmet the hope of salvation (1 Thessalonians 5:6–8). And do this, knowing the time, that now it is high time to awake out of sleep; for now our salvation is nearer than when we first believed. The night is far spent, the day is at hand. Therefore let us cast off the works of darkness, and let us put on the armor of light. Let us walk properly, as in the day, not in revelry and drunkenness, not in lewdness and lust, not in strife and envy. But put on the Lord Jesus Christ, and make no provision for the flesh, to fulfill its lusts (Romans 13:11–14). “Walk while you have the light, lest darkness overtake you; he who walks in darkness does not know where he is going” (John 12:35). This is a lesson we must learn. We need to be good stewards of the light and rest God gives us. We must walk and press on as we have light, as we have clear instruction from God’s Word and know where to go and what to do. We must watch and renew our strength as we have rest, encouraged as we see progress, yet mindful that we are not yet at the journey’s end. When we fail to be spiritually alert and diligent and instead become dull and slothful, we make ourselves vulnerable to a host of doubts and fears. At this point in the journey Christian takes a spiritual assessment of himself. He has made it to the top of Hill Difficulty, but he has also heard frightening news of what lies ahead. Since finding relief from his burden at the cross, he has met with several pretenders in the Way and watched as they scoffed, turned back, turned aside and refused to press on. His recent conversation with Timorous and Mistrust has stirred up fears in his own mind and he begins to question and doubt his salvation. Christian comes to the realization that the same sins he saw overtake and overthrow the pretenders are also in his own heart. He was content to stay and sleep when he should be pressing on in the journey, just like Simple, Sloth and Presumption. He was afraid and uncertain, just like Timorous and Mistrust. How can he be certain of salvation and acceptance at the Celestial City, if such sin and stumbling is evident in his own life? I was once above all the rest, in a very sad and low condition for many weeks; at which time also, I being but a young prisoner, and not acquainted with the laws, had this lying much upon my spirits, that my imprisonment might end at the gallows for ought I could tell. Now Satan laid hard at me, to beat me out of heart, by suggesting thus unto me: But how if, when you come indeed to die, YOU should be in this condition; that is, as not to savor the things of God, nor to have any evidence upon your soul for a better state hereafter? (for indeed at that time all the things of God were hid from my soul). Wherefore, when I at first began to think of this, it was a great trouble to me; for I thought with myself, that in the condition I now was in, I was not fit to die, neither indeed did I think I could, if I should be called to it. Besides, I thought with myself, if I should make a scrambling shift to climb up the ladder, yet I should either with quaking, or other symptoms of fainting, give occasion to the enemy to reproach the way of God and His people for their timorousness. This, therefore, lay with great trouble upon me, for methought I was ashamed to die with a pale face, and tottering knees, in such a cause as this. Wherefore I prayed to God that he would comfort me, and give me strength to do and suffer me what He should call me to; yet no comfort appeared, but all continued hid. I was also at this time so really possessed with the thought of death, that oft I was as if I was on a ladder with the rope about my neck. Only this was some encouragement to me. I thought I might now have an opportunity to speak my last words to a multitude, which I thought would come to see me die. And, thought I, if it must be so, if God will but convert one soul by my very last words, I shall not count my life thrown away, nor lost. But yet all things of God were kept out of my sight, and still the tempter followed me with: “But whither must you go when you die? What will become of you? Where will you be found in another world? What evidence have you for heaven and glory, and an inheritance among them that are sanctified?” Thus was I tossed for many weeks, and knew not what to do. 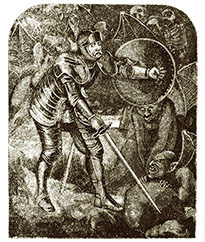 Bunyan describes the real struggles of his heart, as he, like Christian in the allegory, did not know what to do. But take note of what Christian does next. In Christian’s response Bunyan shows us the fruits of humble repentance. Remember therefore from where you have fallen; repent and do the first works, or else I will come to you quickly and remove your lampstand from its place—unless you repent (Revelation 2:5). Unrepentance leads to darkness—the loss of the light of Christ. Repentance is the way to joy and light and renewed hope of forgiveness and life. We must pray that God will not only make us watchful and diligent to walk in the light, but also make us humble and quick to repent when we fail and fall into sin. 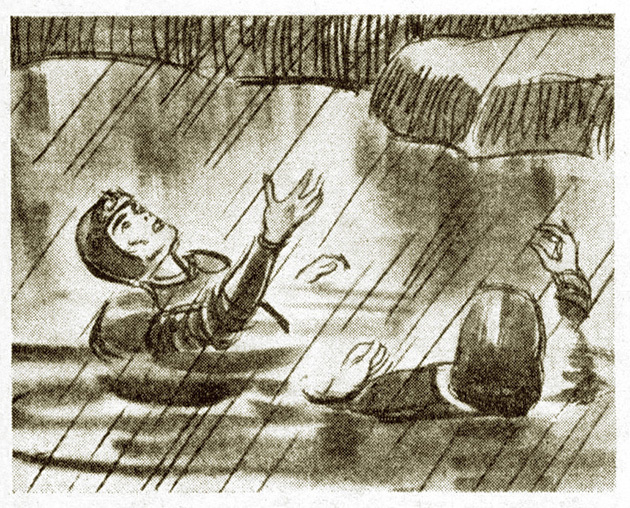 In the next post we will continue Christian’s search for the lost roll as he returns to the arbor.